Written by cskendras on March 26, 2001 to Misc. der Stars” (“The Night of the Stars”) this Thursday at 8:15pm (CET). In 1999, they performed their single “Stars” on this show. Then, on Saturday, they are visiting the “Big Brother” show in Cologne, and performing “Centre of the Heart.” “Big Brother” is one of the most popular shows on German TV. “Showcase” concert in Cologne really rocked! Written by Lars-Erik_Olson on March 26, 2001 to Misc. It was a very appreciative, enthusiastic audience that greeted Roxette in Cologne, Germany today for the first of a series of “showcase” concerts. Fans and others in attendance were chanting “Rox-ETTE!” between almost every song during the fully-staged performance. Those not lucky enough to be there in person were able to watch the concert live over the Internet. A German portal site provided the streaming video webcast in three different resolutions. “Stars” was a vastly different version – “a special version” as Marie said – sung in a slow, almost ballad style. “It Must Have Been Love” featured Marie on the piano… and, of course, the crowd went wild! “I had been expecting some kind of accoustic thing, but it was really, really ’rocky’,” reported TDR reader Judith Seuma, who listened in Spain to the concert over the Internet. Another reader, Per Andrén in Sweden, reports that the sound quality of the webcast was “surprisingly good!” The picture quality however, according to other messages left in our SmallTalk section, was not nearly as good. Written by juma on March 25, 2001 to Misc. The maxi-single for “The Centre of the Heart” will be released on April the 16th. The CD will contain six different versions of the song, with most of the remixes being provided by Stonebridge. Written by T-Rox on March 25, 2001 to Misc. A very simple song. That’s always the hardest to write. The idea was that they both should be singing it. It’s a classic 3-chord pop song which you can have a lot of fun with in the studio. You can do a lot of production to it, what we did. It begins like an old-fashioned home recording. It’s a pop song, one of those I love to write. Was written five years ago. The first version was recorded in Spain for HAND. It was a totally different version, much slower. We made a disco song out of it. A little bit like Frankie goes to Hollywood meets G. Moroder. It’s fun. Marie had a lot of problems to sing it. It’s so simple but you must deliver it from the heart. First she thought, it’s easy, but it wasn’t. She must find the magic lines. They’ve worked really hard on it and in the end, Marie says, she is very proud of the atmosphere and the voice in the song. Will be a single. Per says it’s probably the best song on the album. He had it in his head for six months, before writing it down and making a demo. Written by Lars-Erik_Olson on March 25, 2001 to Misc. STOCKHOLM - EMI Sweden has transcribed the videotaped interview with Roxette, portions of which appear on the Roxette.se site, and made it available to the press. takes about a year to write an album. Written by administrator on March 24, 2001 to Misc. Roxette were in the TOPradio studio in Belgium this (Saturday) morning to promote their new album. The on-air, webcast-with-video interview lasted about half-an-hour. While Marie seemed to be a bit nervous, Per was relaxed and laughing all the time. He even started moving to a dance song upon entering the studio. Mentioning the new Roxette.se site, Per said there might be some new interactive tools added. Amongst other comments, Per said that there will be a new DVD videobox released this year (including rare stuff). He also said there won’t be a Spanish version of this album. Written by frab on March 23, 2001 to Misc. COLOGNE - Roxette’s showcase concert here on Monday, March 26th will be webcast live using streaming video on Germany’s largest internet portal site. The party that night begins at 8pm CET, with Roxette scheduled to take the stage at 9:30. T-Online plans to have streaming video available for those who log onto their site. Then, the following Saturday, March 31st, they’ve scheduled what presumably will be a half-hour live chat with Roxette. Written by Lars-Erik_Olson on March 22, 2001 to Misc. According to EMI Music Canada, they will be releasing “Room Service” on May 15th. Marie Dimberg, Roxette’s manager, said “we have a very strong fan base there, as they are more influenced by Europe than the U.S.” Roxette and EMI are hoping that “Room Service” will do well in Canada. There had been some confusion at EMI in Toronto regarding Roxette. Whether accurate or not, they thought Edel had the distribution rights, and this accounts for the delay from the April 2nd “worldwide” release date. Marie Fredriksson sings a duet with Totta Näslund, 55, a well-known blues artist in Sweden, on his new album due out on Monday. It’s called “Duetterna” (“Duets”). Marie is Totta’s partner in a new arrangement of a song written by Ulf Lundell entitled “Sommarens Sista Servitris” (Summer’s Last Waitress) – the only song on the album that was not written especially for this project. Other female member’s of Sweden’s so-call “pop elite” that appear on the album include Josefin Nilsson, Louise Hoffsten, Kajsa Grytt, Jenny Öhlund, Sara Isaksson, Sanne Salomonsen and Charlotte Berg (from the musical group Charlie’s Magazine). The first single will be “Utan Dig” (“Without You”), that he sings with Sharon Dyall. “The idea behind the project is to blend Totta’s special voice with different women,” says Dan Hylander who produced the album and wrote some of its songs. Amongst other online retailers, the album can be ordered from Swedetown.com, a site that specializes in exporting Swedish music. 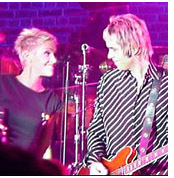 On April 2nd, Roxette’s new album, “Room Service,” will be released in most parts of the world. But for two days now, it’s been possible to download the entire CD from the controversial, legally-embattled Napster file-sharing service. This fact has been the subject of discussion in our SmallTalk forum and on the Roxette Mailing List. Today, it hit the pages of the Swedish newspaper Aftonbladet. “There’s not much that can be done about it. It was the same for Madonna and U2,” said Roxette’s manager Marie Dimberg to Aftonbladet. “We can hope that the majority of Roxette fans will want the real album with the booklet and packaging” she said. Yet to be determined, of course, is how damaging this will be to the overall success of the “Room Service” project. Legal and monetary issues aside, the fear is that it will hurt sales – and therefore chart positions. Other fans cite industry figures that CD sales are up, and feel that that the impact will be negligible. So far, there has been no direct comment from Per or Marie, who are in rehearsals for the upcoming showcase concerts.